Click image to enlarge Stonehenge Memorial, Maryhill, Washington. Image taken April 24, 2004. The Stonehenge Memorial was built by entepreneur Sam Hill as a tribute to the soldiers of Klickitat County, Washington, who lost their lives in World War I. Sam Hill's Stonehenge is a full-scale replica of England's famous Stonehenge in Wiltshire (see "Stonehenge, Wiltshire, England" below). Hill, a Quaker pacifist, was mistakenly informed that the original Stonehenge had been used as a sacrificial site. 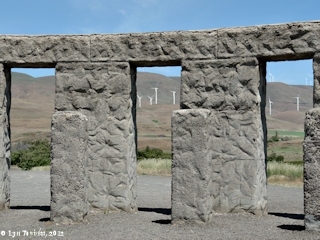 Hill's Stonehenge lies at the original Maryhill townsite, four miles east of the Maryhill Museum, just off Washington Highway 14, and upstream of the Sam Hill Memorial Bridge. 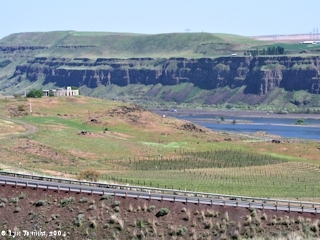 It lies at Columbia River Mile (RM) 210. The site also includes monuments to the soldiers of Klickitat County who died in World War II, Korea, and Viet Nam. 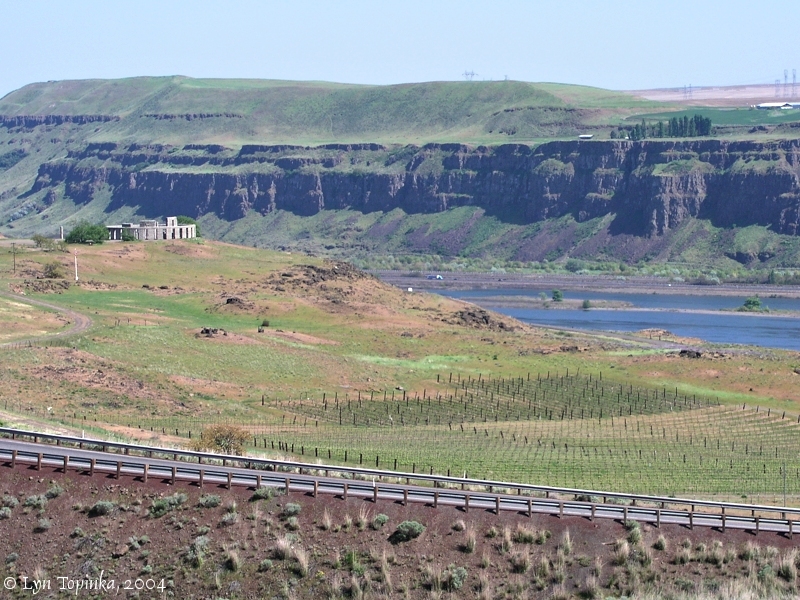 Hill's own crypt is a short walk southwest of Stonehenge on a bluff overlooking the Columbia River. 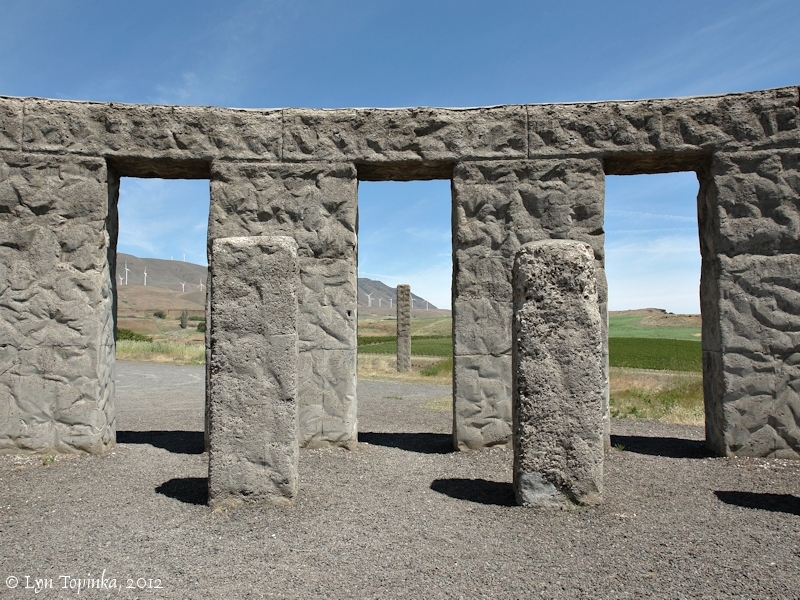 The Klickitat County Stonehenge's altar stone was dedicated on July 4, 1918. The full structure was completed and dedicated on May 30, 1929. 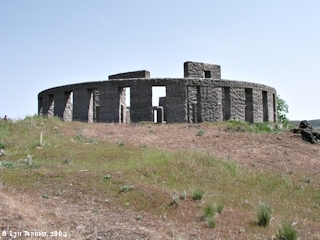 The English Heritage website (2006) states the name "Stonehenge" originates from the Anglo-Saxon period, and the Old English word "henge" means "hanging" or "gibbet". "Stonehenge" therefore translates to "The hanging stones". "... It's thought that the name Stonehenge originates from the Anglo-Saxon period ­ the old English word ‘henge' meaning hanging or gibbet. So what we have is literally ‘the hanging stones', derived probably from the lintels of the trilithons which appear to be suspended above their massive uprights. Today the word ‘henge' has a specific archaeological meaning: a circular enclosure surrounding settings of stones and timber uprights, or pits. 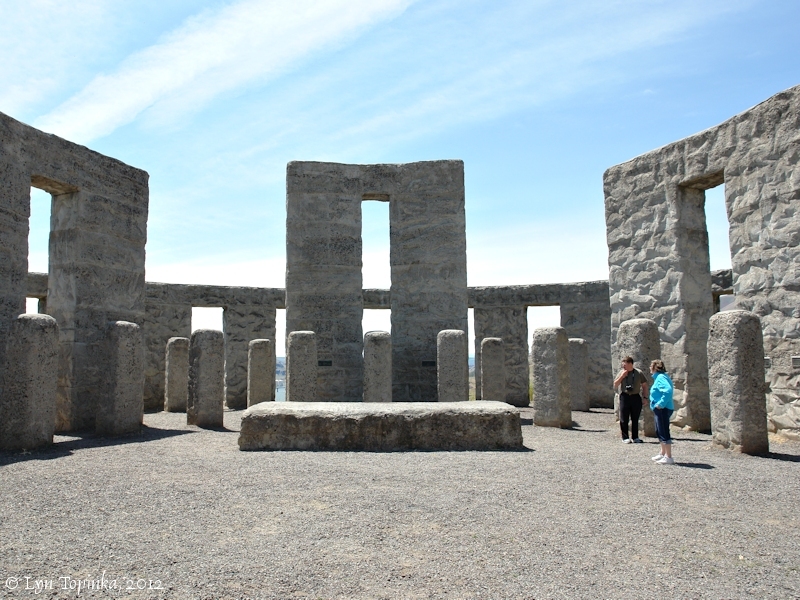 ..."
Click image to enlarge Stones ... Stonehenge Memorial, Washington. Image taken May 29, 2012. 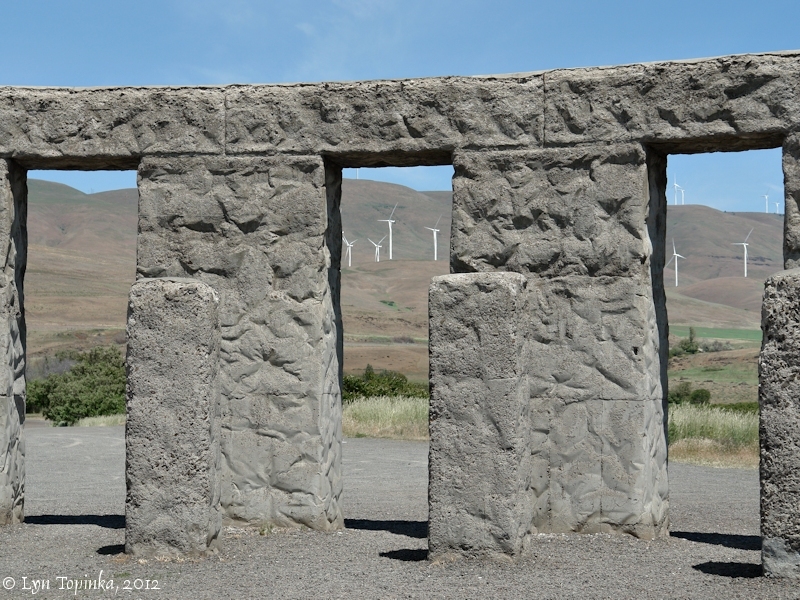 Click image to enlarge Wind turbines ... Stonehenge Memorial, Washington. Image taken May 29, 2012. Click image to enlarge Heel stone ... Stonehenge Memorial, Washington. Image taken May 29, 2012. 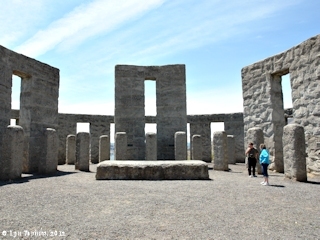 Click image to enlarge Altar stone ... Stonehenge Memorial, Washington. Image taken May 29, 2012. Click image to enlarge Sign ... Stonehenge Memorial, Washington. Image taken May 29, 2012. 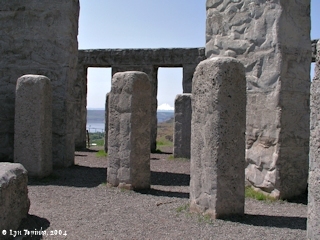 Click image to enlarge Mount Hood, Oregon ... Stonehenge Memorial, Washington. Image taken April 24, 2004. 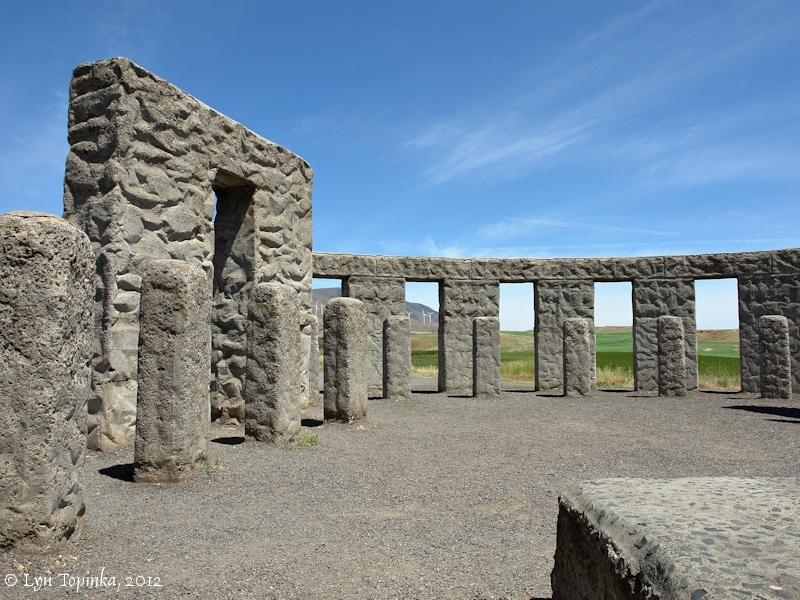 Stonehenge Memorial sits on a bench cut into the north wall of the Columbia Hills by the Missoula Floods. In places this bench is nearly one mile wide. The original "Stonehenge" is located in Wiltshire, England, on the Salisbury Plain. This Stonehenge was built in three phases and has existed for over 5,000 years. The following compilation is primarily from "About Stonehenge" and "English Heritage" websites (2006). First Phase: The first phase of Stonehenge was constructed around 3,100 B.C. (Neolithic period) and was a circle of 56 holes surrounded by a bank and a ditch and another bank. Today the holes are known as the Aubrey Holes, named after John Aubrey, who discovered them around 1666. The holes vary from 2 1/2 feet to 6 feet in width and are evenly spaced (approximately 19 inches apart center to center) in a 288-foot diameter circle. The purpose of the Aubrey holes is unknown. The outerbank is approximately 380 feet in diamater, 8 feet wide, and between 2 and 3 feet high. It is now mostly destroyed. The innerbank is solid chalk and stood at least 6 feet high, 20 feet wide, and had a diameter of 320 feet. Unlike most henges the large bank of this first Stonehenge lies inside rather than outside the ditch. The entrance to this early "Stonehenge" faced northeast and nearly 35 feet wide, and was aligned on the midsummer sunrise. Just outside the entrance is a heel stone made of sarsen sandstone. This stone is approximately 20 feet long and 8 feet wide by 7 feet thick. The lower 4 feet is buried in the ground. The heel stone is surrounded by a small chalk-filled ditch. Second Phase: The second phase of Stonehenge construction was between 2,900 and 2,400 B.C.. Post holes were randomly placed within the henge, possibly used to support wooden structures. The purpose of these possible structures is unknown. Also during this period the entrance to the henge was widened by 25 feet and a 40-foot-wide avenue extended outward two miles to the River Avon. Third Phase: The third phase of Stonehenge is the stone monument, built between 2,600 and 1,600 B.C. (Bronze Age). This phase itself consists of three to six subphases. First two concentric circles of at least 82 bluestone "Menhirs" (large, rough-hewn standing stone) were erected around 2,500 B.C., using stone transported from the Prescelli Mountains in Pembroke, South Wales, approximately 245 miles away. Each stone weighed 4 to 5 tons. 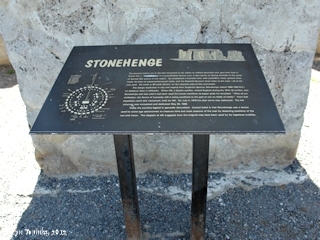 They were placed 6 feet apart and 35 feet from the center of the henge. Next, around 2,300 B.C. the bluestones were dug up and rearranged, and thirty large sandstone Sarsen stones were erected in a 100-foot diameter circle. Some of these stones weigh nearly 45 tons, and are from a quarry 20 miles to the north. These stones were erected and topped with lintels. Within this Sarsen circle five trilithons (pairs of uprights with a lintel on top) were arranged in a horseshoe shape. Finally the bluestones were arranged into their present form as an inner circle and horseshoe, duplicating the Sarsens. This Stonehenge was aligned with the rising of the midsummer sun. In 1923 Lieutenant-Colonel Hawley discovered two more concentric rings of pits about 20 feet apart, circling the Sarsen stones. What they were to be used for is unknown. 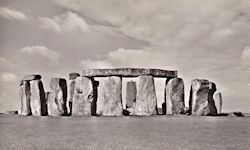 In 1918 the British government acquired Stonehenge from its then current owner Sir Cecil Chubb, and today it is managed by English Heritage on behalf of the Government. In 1986 it was inscribed as a World Heritage Site. The monument today is about half of the original monument. Penny Postcard: Stonehenge with sheep, England. 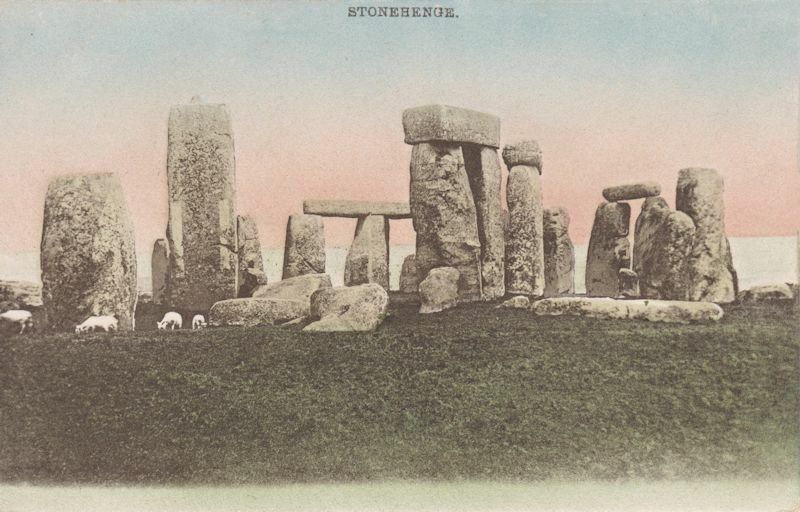 Penny Postcard, "Stonehenge". Printed and Published by The Mezzotint Co., Brighton. In the private collection of Lyn Topinka. 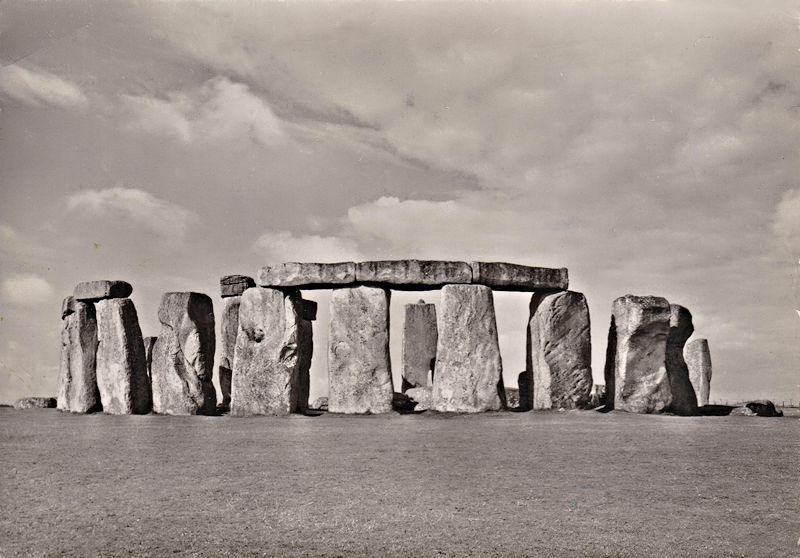 Penny Postcard: Stonehenge, England, ca.1935. 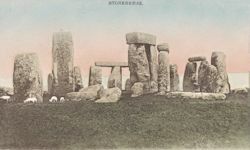 Penny Postcard, Postmarked 1935, "Stonehenge, near Salisbury". H.B. Ltd. London, F.C. 1, Entire British Production. In the private collection of Lyn Topinka. Penny Postcard: Stonehenge, England, from the northeast. Penny Postcard, "Stonehenge, Wiltshire, From the North-east". Ministry of Works 3, Crown Copyright, Printed in Great Britain. In the private collection of Lyn Topinka.